This project was created on 04/23/2017 and last updated a year ago. This hardware project is "Open Source" and for all "Private-Uses"! Comercial User (Companies) should ask me for the mass production rights! 1. Picture is the complete Telescope-Control-Unit, incuded the "Arduino DUE" Board. 2. Picture is the control unit with look at the bottom side, this can be odered by me. 3. Picture is the driver unit for the two stepper motors and joysick hand control unit. The last two pictures are the PCBs, top and bottom side. It is not unknown that the RESET routine of the Arduino DUE does not work properly. I have tested a circuit that fixes this problem. As seen in the photo, after switching on the operating voltage, it takes more than 150mS to reach the voltage of fully 3.3V level. In the CPU integrated RESET routine starts already after approx. 3mS! This very short Master_RESET delay is the reason, why the Controller starting mostly with blank Screen! The RESET Circuit I&apos;ve created, works properly and in the next Version of the Controller it will be integrated. It is a SOT-23 Chip with 3 Pins and can easy soldered on the older Controller Boards too! The version from 3. Sept. has an input voltage capabilities from 15V up to 24V! This driver Board is only compatible to the Main Unit V1.4c and later! I&apos;ve a suitable cable for the stepping motors manufactured. It can be loaded with 1A / contact, which means 4A / motor! The max. outer diameter is only ~ 12,5mm. This Connectors are maded for Aviation and they are watheproof! For disconnecting, you need only to pull back the outer Shell and pull the cable a way! The finished version V1.4d is ready to use, you need only 2 NEMA17 mounted on your Telescope and let it run! + Bottom holder aluminium plate with two cables (~ 50-60cm long) including a 5V Fan 25x25x7mm. The price will be 325 CHF (Swiss Currency) including PayPal fee and shipping costs. This is the latest and finale Version of the series V1.4x! The enhanced Version V1.4d is finished and can ordered after 20. Oct. 2017! The next Version V1.4.1 brings some more enhancements, like new Joystick with high accuracy digital intrface for a very precise manual aligning of your Telescope! The whole height of the device will be only 28.3mm! The bottom side of the housing is made of 1.5mm aluminum and is used as heatsink for the motor drivers! This Version is planed to finished and could be ordered, probably at the end of this year. The price for the assembled and tested Controller, without enclosure cost $205 including the shipping costs. For the Version wiht enclosure, the price is not fixed yet. Some Users could make it with 3D Printing. It would be 3D printable and the STL-Data can be downloaded here. Dessislav Gouzgounov (Bulgaria) and with helping of community of over 250 members! It is assembled and tested and will be shipped without Arduino DUE and without Motors. The "rDUNINOScope Control V1.3 (or newer) Unit works only with Arduino DUE or compatible Boards and the "rDUINOScope" Software! This are the Geber Files for Main PCB + Controller V1.4c Use the optimized Controller above! Probably the last version of 1.4x is finished. Some usefull enhancement is maked and the PCB is now "Black-Magic". This Version of the PCB using the DRV8825 Stepper Drivers for 100% compatibility to the Firmware rDUINOScope V2.3x and bellow. The next Version 1.5 has much more changes. One of them, is the implementation of IPS Display with 320x480 resolution & Capacitive Touch Screen. I think, it could be finished first in about 3-4 months or more! I&apos;m sorry but we want to make a lot of improvements and for this we need much more time than we had planned. Not only the Hardware must be finished, the software must be completely rewritten an tested! The Version 1.4 include the Buzzer and implementation of DRV8825 Stepper Driver. With this changes, we have 100% compatibility to the rDUINOScope Firmware 2.1 and bellow. 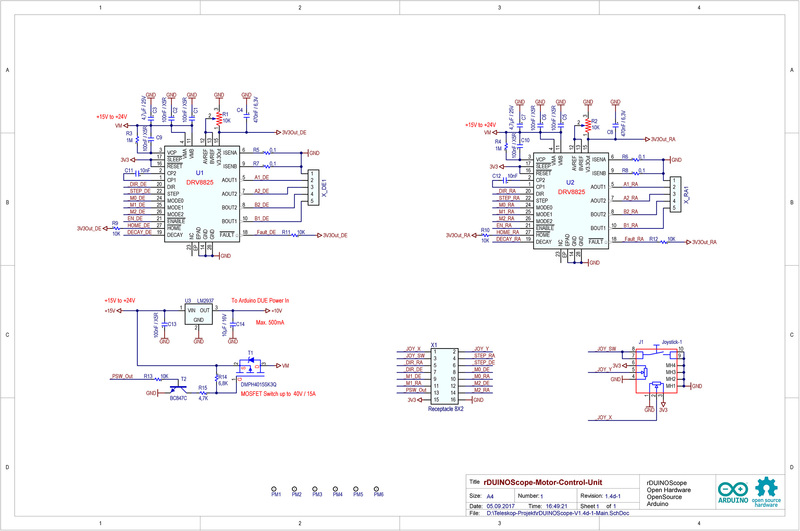 This Version included changes in Power section, I&apos;ve included a 3V3 LDO for Unit Power. It do not use the 3V3 Power from Arduino DUE, because it use the 5V0 that has more Power. The Version 1.3 is the initial one. It works wit rDUINOScope FirmWare 2.1 & before. in soldering of very small SMT components. Some SMT Pads, has a gap of only 0.2mm, see the picture bellow! and we need an oscilloscope! because the Pad is on the bottom side of the Chip! I think, the better way to sell this unit as tested and working assembly. no problem but on own responsibility! I would like to know if it is possible to use a Escap P530 motor. The P530 motor has 4 windings which can be used either in series or parallel. It has 100 full steps per motor revolution (or 200 half steps). The motors are wery interresting and you schould try it at your own risc! This are very expensive motors because of the high quality, it costs over $250!!! Can this system drive larger size motors than 42 stepper motors? For example, 60 or 86 specifications of motor, or DD motor, or harmonic deceleration motor? Usually these motors have independent motor drivers. Seeing that your new version of motor controller can provide greater voltage, can the output be connected to a separate motor driver or still be driven by DRV8825? I think the DRV8825 chip is still very hot when it works. Thank you very much for this project and look forward to your reply! Thank you very much for sending me a new version of the data? Sorry, no, the Driver section is capable to drive up to max. 2A / coil! Hello, how about the guide? I haven&apos;t seen the ST4 interface of the guide star. Do you have a plan to perfect the guide star? If so, I believe it will be more perfect. The rDUINOScope Motor Driver Unit is fixed with DRV8825 Chip! The DRV8825 can drive only about 2A / phase. Of course, the DRV8825 will be very hot, if we don&apos;t use a heatsink! My Driver Unit goes up to 45-65 C° after 4-5 hours observing at night. It is depending from ambient temperatures. I have been following this project for a while now, and want to make one myself. Would you be so kind to share the latest gerber files? Looking forward building this nice piece of hardware. I sent you all Data of the newest Version V1.4.3! Thank you very much for sending me a new version of the data. I&apos;m a college student from China .I was very interested in astronomy.I bought my first telescope when I was in junior high school.For a long time,I used the telescope to observe stars alone.Now ,my major is automation,but I haven&apos;t learned the circuit yet.I want to combine my major and my interests,but my expertise is not enough.So now I ask for your help.I have been following this project for a long time.The first time I saw this project from #rDUINOScope.I&apos;ve found lots of parts,but I can&apos;t made the PCD board.Would you please provide related raw design files for me?I just made it for my own use.I think it makes sense to learn more from science lovers all over the world.If there are other problems later,I still want to ask you for advice. I have an EQ5 equatorial mount, with a Celestron C8. I am interested in purchasing the latest version complete assembled. What is the price and costs of shipping to Lisbon Portugal. Which motors are most suitable for this assembly and respective pulleys. The hardware is designed to drive two NEMA17 motors! Ii is an amazing project and found on google, because I tried to find a related GOTO project, I am very luck to find this. So I bought Arduino DUE, GPS module, BT module, and very hard to find the HX8352A TFT LCD， I have to build my own shiled for the TFT PCBA..I wonder if the 1.4D ver PCB is open source or not? IF yes, I am going to order a formal PCB in China. If it is not open source, i have to use my homemade PCB with much wires. Hello Otto, could you please send the GERBER file to : FSCLUB@YEAH.NET , Thank you so much! Hi, fsclub, have you a really name? My project is fully open source for any private use! All who should plan a mass production have to make an agreement with me! It is not so easy to build up this system, without any truble! The Parts are very small and if you do not have the experience to solder such small parts, then it usually goes wrong and it was only a wasting time for nothing! My interests are not profit-oriented, I only want one, when somebody wants to buy or build this system, he should be able to work with it, without problems. Only the gerber files alone, will not help you. You need all the data of the components and the assembly information! I have already made in China, circuit boards, they had to throw away because of bad quality,! If you get it running, give me a little feedback! My name is Daniel Zhou, from China. I exactly know what you said about the difficulty to finish these kind project, not just flash a led. I have this hobby about making electronics by my self more than 20 years, and there is no problem for me on this project to solder and test, and repair. 0603 SMD components are good for me, even 0402 is also ok for me to manually soldering. TSSOP, TQFP is ok for me. I have got the PDF SCH file and printed on my desk. I even planed to covert the PCB picture to *.pcb file if there is no other choice. This is really good news for me that you can provide related raw design files that I can save many hours to do this action. You PCB design is really perfect. There is a little problem is my TFT pin map may be a little different than yours, that need a further check, so I may have to modify a little or make another shield to fit your PCB design. I will check this carefully. Of course I will sign what you mentioned the non-commercial statements or related files, I just do it for my own use purpose. I will send you the pictures after accomplishments. I am interested in buying, very interesting your project. Let me know how we can handle a possible purchase. Actually I don&apos;t have any assembled Conroller, because of redesigning & many improvements. The next working controllers (V1.4b) could be finished in 3-4 Weeks. Sorry for the long delaying, but I&apos;ve to order new PCBs next week! You can bay the assembled and tested controller for $205. This price including the PayPal & shipping costs. Yes, You can run both from a 12V 2A+ but for two motors, better 4A+! SHOULD I supply power separately to the motor driver circuit? OR can I run both from the same 12v 2A+ supply?? The Stepper Motors generate much of "EMC interference" that could influense the Arduino Board Functions! The EDA (CAD) files are not published and because it was designed with Altium! I will publish the GERBER Files for User, they want to produce the PCBs it self. I have received my rDuinoScope 1.4 unit from Otto, and it is a MASTERPIECE!!! Beautiful construction!! THANK YOU!!! Thank You and enjoy it and good luck for all experiences! Yes, the Version 1.4x is Open Source HW and for the later Versions 1.5x-1.9x probably to. From the Version 2.0 we will sell it only as assembled and tested Hardware, because of high complexity and it is a Standalone Version, without Arduino or any external Modules. One PCB in a case without any cable! It will controll the Motors over Wireless! With one Lithium Cell, (3700 mAh) it would work over 9-10 hours. For The Motors we need an extra Power Stage with 15-20 Ah for the same Time. Thanks for this info! where can I find the CAD files? I would like to make a PCB and check it out. Will this project be OSHW at all? How can I purchase the PCB&apos;s please? Thank You WONDERFUL Project!! Hello Lee, Thanks for your interesting! I&apos;m ready to buy, How do I proceed? Thanks! Also, are the custom boards OR completed units for sale? The assembled & tested Board cost 150 € or 170 USD + shipping costs. Without stepper motors and without Arduino DUE Board! Hello Lee, thank you for your interest of my harware. I&apos;m using a single TFT and not an assebly like in the Link you posted. • Probably this is not the right place to post this comment, and maybe I should write a Private Message. I do not know to whom I should write of how to do it. I do not know the etiquette rules of this site yet, and I prefer to be extra-cautious. I have just joined Hackaday because of this stunning rDUINOscope Control project. I also need to be able to use my own stepper motors with their specific step count. Therefore, this project suits me perfectly. I have been looking for something like this for ages! • I want to make a rDUINOscope Controller, and I want to make one and test it as soon as possible. I am ready to buy all the pieces from eBay or Aliexpress, but I need the PCBs. I imagine you can provide them. I would like to buy a bundle (a kit with all the items) from you, if possible. • I would like to join your project and get involved in it, but I do not know if you need me, because my programming skills are very basic. I can solder pretty well, and I could test the controller of contribute in other forms. • I would like also benefit from the V 1.5 version of the project, but if you have old V 1.3 or V 1.4 PCBs that you want to get rid of, I can buy them and make an older version. I&apos;m working on the V1.5 but the changes are much more as planed. The V1.4a is the latest working version and it is 100% compatible to rDUINOScope code from Dessislav. New PCBs V1.4.a would be available in about 2-3 weeks. For all Users, Likers, Followers, tahank you for your interest on this usefull project! I&apos;m shure, that this hardware unit, could help, for many telescope owners, who do&apos;nt have any positioning control unit, because they are too expensive. Any suggestions or constructive criticism, are welcome! You are about to report the project "GoTo Telescope Control for rDUINOScope", please tell us the reason.